Every year since 2006, NSRAP has participated in events to mark the International Day Against Homophobia and Transphobia, an annual day of action. The Halifax rally is organized by a committee of community volunteers. If you or your organization are interested in helping plan this year’s event or can provide other types of support, please contact NSRAP. 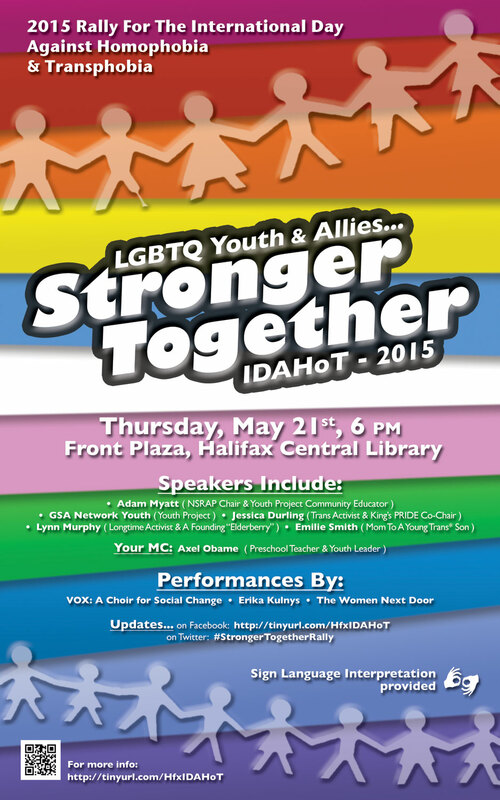 The 2015 rally will be held on Thursday, May 21st at 6 p.m. at the Front Plaza of the Halifax Central Public Library (corner of Spring Garden Road and Queen Street). This year’s theme is focused on LGBTQ Youth & Community Allies. For more info, or to volunteer, contact NSRAP@nsrap.ca. Help spread the word by RSVPing via Facebook and sharing with friends. In 2009, we participated in the first annual rally in Grand Parade in front of Halifax City Hall. In 2008, we partnered with the Youth Project and Halifax Pride to launch a public service announcement denouncing homophobic bullying, produced entirely by youth. We also traveled to Pictou County to protest their municipal council’s ban on flying the Rainbow Pride Flag. Along with local activists, we wrapped the County offices in a giant Pride Flag. In 2009 and 2010, the Halifax rallies returned to Grand Parade Square. Following a violent homophobic attack in Cape Breton in 2010, NSRAP members traveled to Sydney to take part in their demonstration and to stand in solidarity with their community. 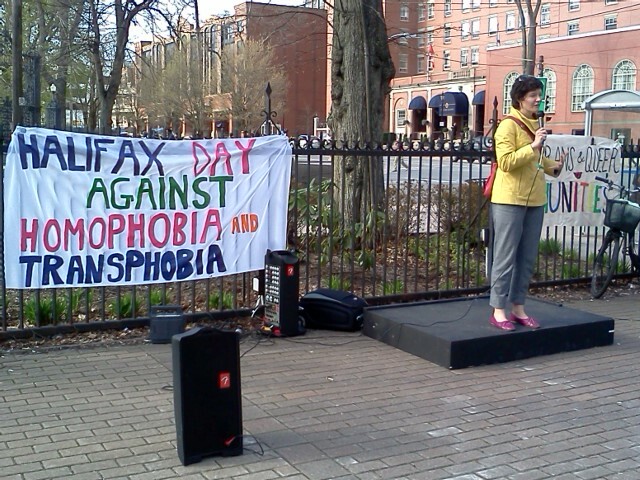 In 2011, the rally focused on “From Local to Global” with tips on how we can all help counter homophobia and transphobia in our own communities and those abroad.